Taste test: These are very good ripple chips. 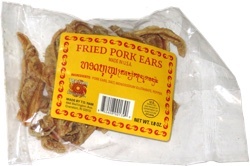 They've got lots of flavor without much salt. They're cut fairly thin, and they feel light in your mouth, yet they're fairly strong chips, should you choose to dip with them. Good crunch, too. And, most impressively, they just might be the least greasy potato chips anywhere — they leave no shine on your hands at all. Best I can tell, whatever Troyer Farms is claiming to have done to remove the oil is absolutely true. 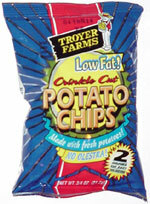 Company: Troyer Potato Products, Inc.